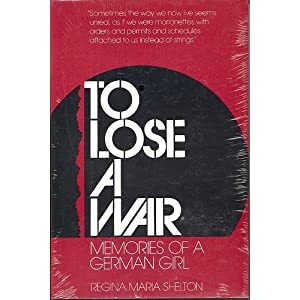 Title: "To Lose a War: Memories of a German Girl"
Comments: What is different about this book is that instead of the usual approach of describing events in purely chronological order, here one starts in the present day (well, the early 1980s when it was published) when the author is going to visit her country of birth, then recalls the events of the 1930s and 40s and her experiences, before returning to the author actually visting Silesia. The author's question, from page 184 of the book, sums up, to me anyway, the whole issue of the "Flight and Expulsion" where she asks "How can a whole people be uprooted, disowned, tossed aside like useless flotsam - how? With the stroke of a pen, with a new line drawn on a map, we are sentenced to homelessness."